It’s usually under the guise of “improvement” and “modernization,” but even with less than perfect vision, they aren’t fooling any of us: bad things happen to good buildings. You know it when you see it: as hard as you try to make sense of it, the pieces of the puzzle do not go together. But put together they have been, negatively impacting the aesthetic of a defenseless building and the city at large. One of numerous examples stands on the northeast corner of Pennsylvania and Washington streets. You have to wonder if the original architects–Rubush and Hunter in this case–are rolling over in their graves due to how the architecture firm of Lennox, Mathews, Simmons and Ford desecrated the original R+B design. 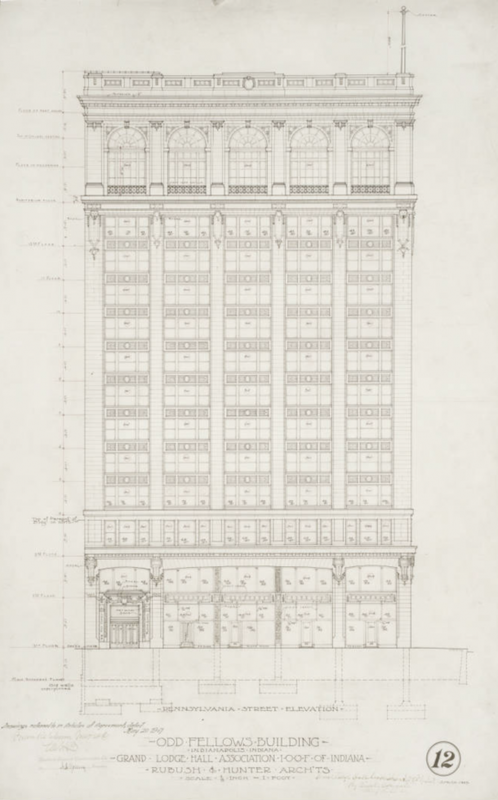 If you want to look at the details of the original design up close, zoom in on the image available on the Indiana Historical Society’s visual collection site. 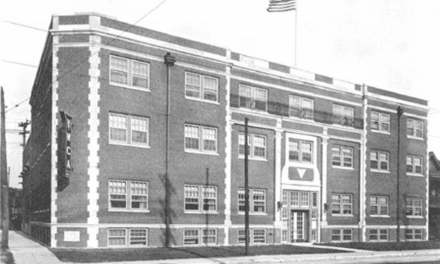 Originally the Independent Order of Odd Fellows Building, the organization utilized the top two floors for club purposes and rented out office space in the remainder of the building. The top–13th– floor housed a massive auditorium. Below is a partial view of that space. Noteworthy in the image are the Trompe l’oeil archways on the walls, mirroring the tall arched windows of the top floor visible from the street. 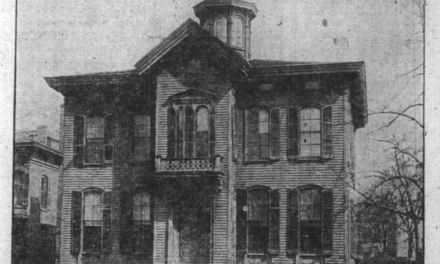 There were very few modifications of the building’s exterior from the time it opened in October 1908 until a new tenant came along in 1955. 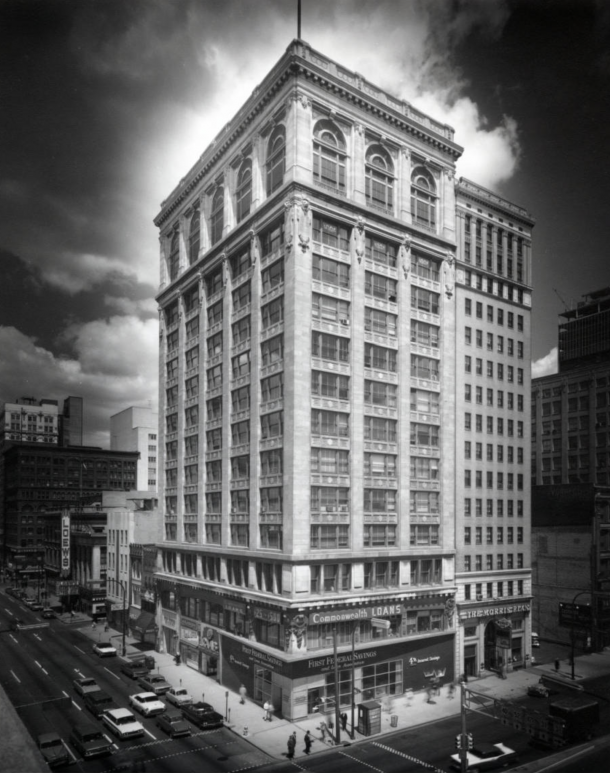 The First Federal Savings and Loan Association of Indianapolis moved their offices into the first floor of the building in October 1955. Though it’s unclear whether the street level facade was altered when they first moved in or if the incongruous alteration happened after they acquired the building in 1960, I believe it likely some alteration was made prior to the building’s purchase. Why would they slightly alter the street level, only to make far larger changes to the first three floors (and the top floors) of the exterior within a couple of years? The image below, from 1961, shows the first altered iteration, ostensibly to–as closely as possible–look like other freestanding branches of First Federal Savings and Loan. 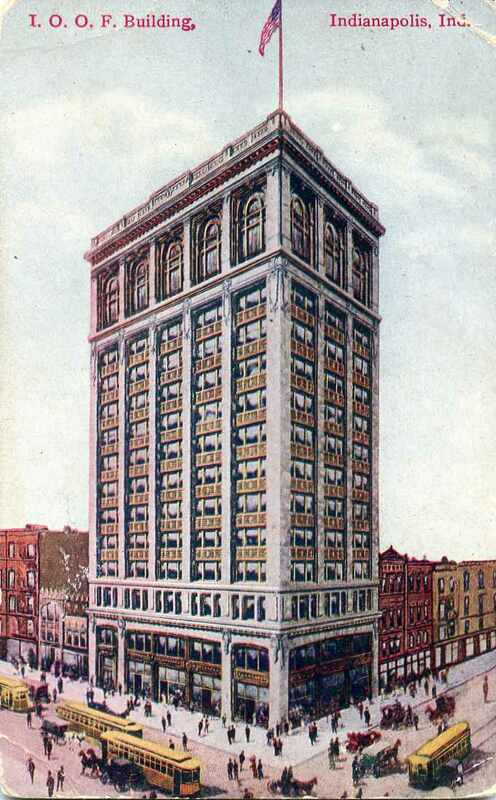 As of 1961, the top floors were still in tact as originally designed. 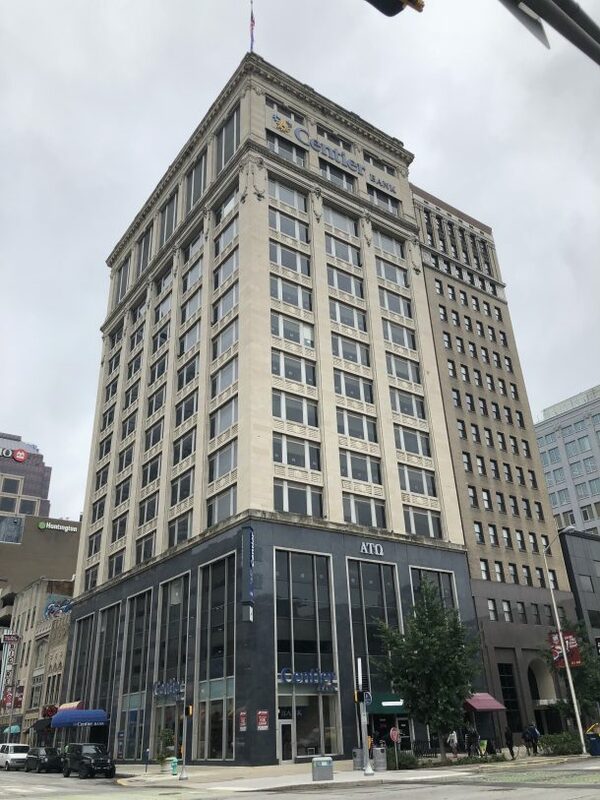 Articles about the sale of the building by the I. O. O. F. to First Federal Savings and Loan indicate that in October 1960, the new owner planned for a “modernization program” estimated to take at least two years to complete. 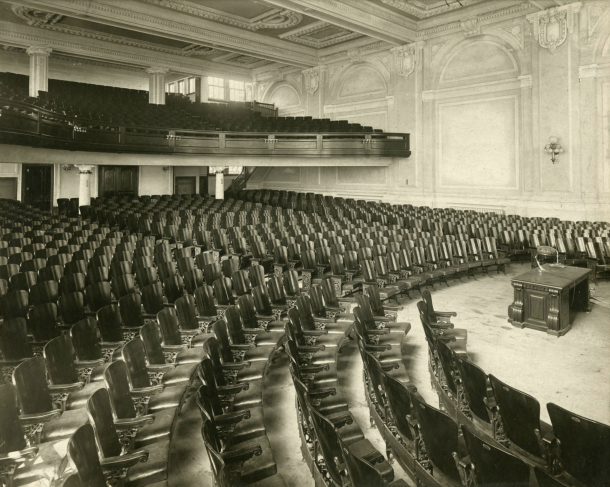 They had no use for a showy auditorium, so despite its beauty and superb acoustics, that space was immediately slated for conversion to additional office space. The new owners said the original price of the building was $400,000 and that they would be spending twice that to “modernize” the structure. 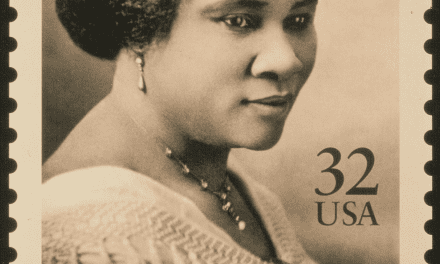 Plans included lowering ceilings from 12 feet to 8.5 feet, to accommodate a new air conditioning system. Infrastructure updates to the interior, yes, understandable; “updated” exterior? Not so much. 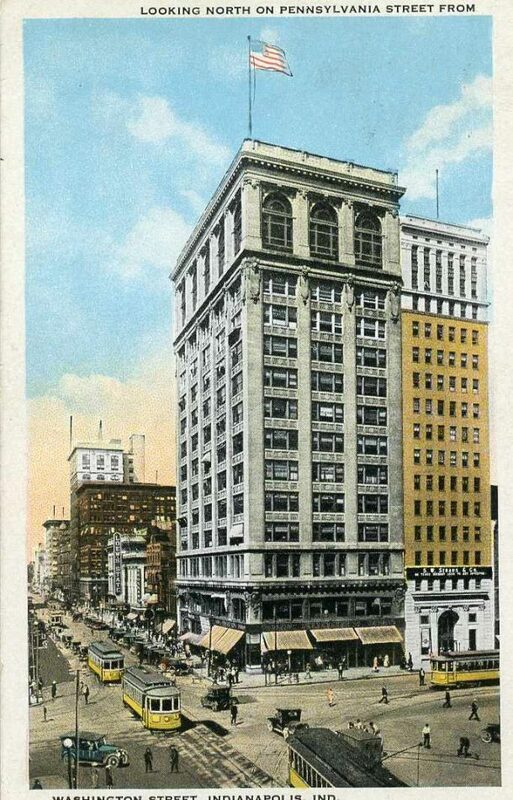 The once open stairway was enclosed; new automatic elevators “the first of its kind” for Indianapolis replaced the existing ones. The old heavy mahogany doors were refinished and recut for larger glass insets. Marble was removed and retained after repolishing. The one “update” that seems utterly gratuitous: the door knobs were all dismantled, cleaned, and chrome plated, after the “IOOF” insignia was ground out of them. (ouch!) As if removing those initials changed the building’s preceding history. But clearly, there was little nostalgia for such things amongst the new ownership. 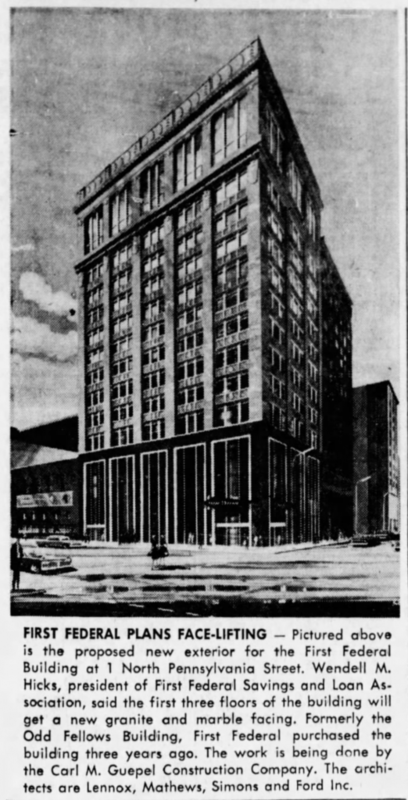 Rendering of proposed changes to the building in October 1963. In 1963, the above rendering appeared in a local paper, intending to further obliterate the street level facade, up to the third floor. And to top it off, switching the lovely arched windows at the building’s apex to a truncated version of all straight lines. 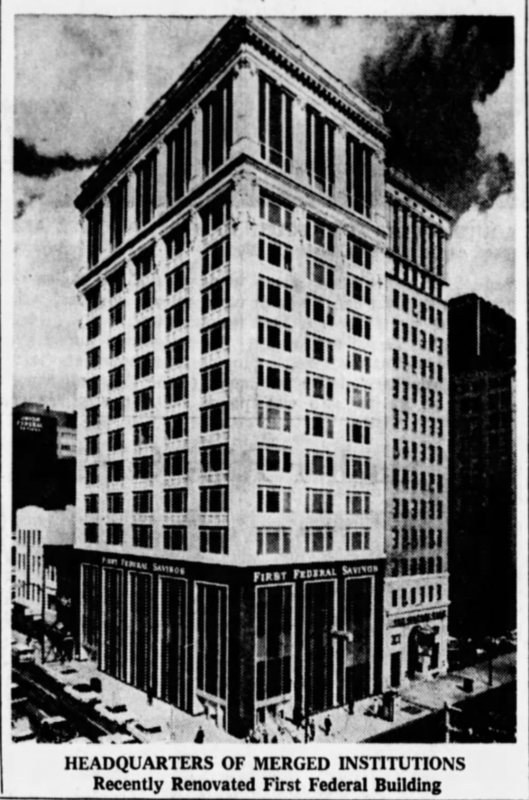 The newspaper image below, looking much like the one above, appeared in the news at the end of 1966, when First Federal merged with Celtic Federal Savings and Loan. Sadly, the same heavy, incongruous alterations still mar the once beautiful first three stories of the building, now with a different bank’s label. Especially the first 3 stories are desperately overdue for a makeover. 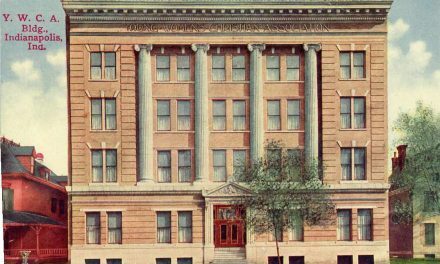 If only the building’s exterior could be restored to its original look, that corner of Pennsylvania and Washington streets would be much improved. It would be nice to see a good thing happen to a good building for a change. As the building appears currently, September 2018. NextA Local Place for Young Women: Y. W. C. A. What an amazing building. Unfortunately, many of these old building were beautiful, but not practical. Built before air conditioning, they were either narrow or hollow in the center for air to flow, and tocool the building in the warmer months. They also did not anticipate future wiring (electrical & internet) that makes building “evergreen”. Several buildings downtown had resturants, open patios on the roof, or auditoriums and/or public spaces on the top floors because there was more airflow and flys rarely venture above 5 stories.